The Austen Project is a breathtaking tribute to Jane Austen. I can’t wait to read the other five “updates” while being reminded to reread, joyfully, the originals. The queen of crime reimagines Jane Austen’s gothic satire. 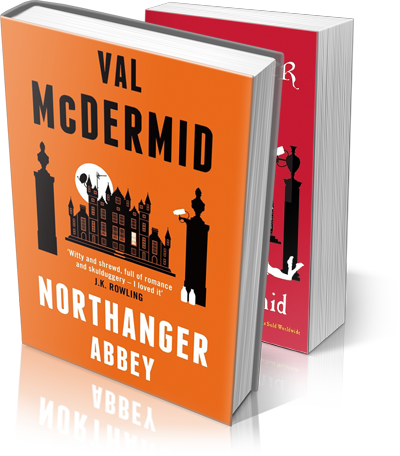 Following Joanna Trollope’s oh-so-readable Sense & Sensibility update, crime writer Val McDermid takes up the mantle in the second of the Austen Project series. The marriage of Austen and McDermid should keep us on the edge of our seats. An exquisitely realised tale of the uncertainty and brutality of teenage years told with the lightness of touch and humour that Val is famous for. It also contains the most detailed, and honest, description of the Edinburgh Fringe that I’ve ever had the pleasure of reading. I’ll never look at the Book festival in the same way again. Utter brilliance from McDermid. NORTHANGER ABBEY is funny, clever, subversive and Scottish. No bonnets – all brio. Rife with conflicts of love, gossip, misunderstandings, and updates on social media, it is an accessible and enjoyable read, especially rewarding for young readers as a gateway into appreciating the classics. McDermid’s reworking of the original novel is intelligent, amusing and well-written… captures beautifully how it feels to be a teenager… McDermid is a subtle and witty writer and it’s hard to imagine a better evocation of the spirit of the original. A fun rendering… McDermid’s Abbey, with its passageways and dark corners, is fantastic, and this novel is a lark. McDermid’s great virtue is to have made Austen’s characters seem fresh in the way they would have been for her first readers… I can imagine Jane herself applauding. … note perfect… breezy, vital, inventive… Her obvious pleasure in the task is as contagious as Austen’s wit … The only possible recommendation is to acquire this book and read it. NORTHANGER ABBEY by Val McDermid is light, fun and full of enough charm from the original story and interesting new twists to be a very enjoyable read. The Austen Project pairs six bestselling contemporary authors with Jane Austen’s six complete works: Sense & Sensibility, Northanger Abbey, Pride & Prejudice, Emma, Persuasion and Mansfield Park. Taking these well-loved stories as their base, each author will write their own unique take on Jane Austen’s novels. The Austen Project will launch with the release of worldwide bestseller Joanna Trollope’s reimagining of Sense & Sensibility in October 2013, and will continue with Val McDermid’s reworking of Northanger Abbey in Spring 2014 and Curtis Sittenfeld’s Pride & Prejudice in Autumn 2014.